This is the homepage of NAVGEN, an algorithm to determine the accuracy of 2D position fixes collected by electronic navigation systems. The NAVGEN algorithm has been developed by the author since 1984 in order to provide to the user a concise and easy to handle error calculus. The main output of NAVGEN is an error radius related to a fixed probability, the CEP95 value. When the work started, a variety of different error measures were in use, some of them based on actually inappropriate one-dimensional statistics, others even without known probability. As the NAVGEN algorithm shows, CEP is is not so easily calculated. Before the NAVGEN algorithm appeared, tables or graphs had to be used, which is overcome since. The author is happy to note that CEP is now frequently used, even for GPS receivers in the leisure market. This page provides background information on the NAVGEN algorithm, download of the algorithm in form of a MATHCAD® worksheet, and it points to a separate page where evaluations performed can be found. In Germany we have a saying: ‘To measure means to compare’. When you measure a length, using a yardstick you are actually comparing the length to the wavelength of light, which latter is defined as the standard for the dimension of length. As this is not a very practical procedure, you use a tool, the yardstick. No tool is perfectly calibrated, so the tool introduces an error in the measurement. A zero offset in a measurement tool introduces a constant calibration error for all measurements in the series, whereas a constant error in the scale divisions of the yardstick introduces an error, which is proportional to the length measured. The calibration error can be determined by using a more accurately calibrated tool and can be cancelled or minimized in this way. The calibration error is also called 'Systematical Error' or 'Bias'. If a measurement has a small calibration error , it has a 'high accuracy'. If you measure the height of the same person with a yardstick 100 times or so, you will probably get data that differ by a few millimeters. Provided the yardstick is perfectly calibrated and the height of the person does not change during the measurements, this error is caused by inaccuracies in the individual readings. In the normal case, half the readings will be too short, half will be too long. If one takes the deviations from the mean measurement, these values are the random errors following a Gaussian or Normal Distribution. In the case of position determination you actually determine two quantities, the latitude and the longitude. These two quantities are measured in degrees (and fractions thereof). For the determination of the position error in distance the measurements have to be converted from degrees to metres. The resulting values are usually called Northings and Eastings. The random errors in distance can be determined if a large number of measurements are made on a fixed position, and by determining the individual deviations of the northings and eastings from their mean values. If the random errors are plotted in an x/y diagram then the data will produce either a Scatter Plot (Fig. 1) or a Random Walk (Fig.2) In a scatter plot the individual errors are (seemingly) independent of each other. A random walk suggests residual systematic errors, e.g. caused by small unnoticed variations in the satellite ephemeridis, by path variations of the transmitted signals in the ionosphere, or by deliberate data manimulation. Such a random walk necessitates a longer measurement/averaging period and further statistical treatment (decorrelation) of the random errors (c.f. Autocorrelation function). 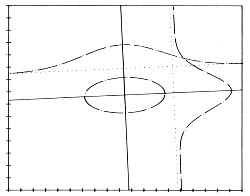 Error ellipses as an error contour are not very practical for navigation, as five parameters are needed for their description, the origin, the length of each semi-axis and the orientation (e.g. angle between the major semi-axis and the x-axis. A more handy contour is a circle, which is fully described by the origin and the radius. In the case of error contours, an additional parameter is the 'confidence content', i.e. 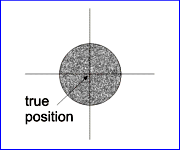 the probability that a measured position lies within the contour. (For a sufficiently large number of position fixes the probability should be equal to the percentage of fixes lying inside the contour.) In navigation we usually require a probability of 0.95, i.e. 95%. Sometimes the Rayleigh PDF is used as an approximation for the bivariate distribution of navigation errors. A pre-requirement for this approximation are equally distributed and uncorrelated errors in both coordinates. As can be seen in the chapter below, this assumption is not always true, particularly with GPS measurements in the order of the correlation time. The NAVGEN algorithm, however, provides a consise calculation of CEP errors. 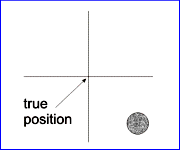 If a position measurement has a small error circle, it is a 'high precision' measurement. One-dimensional statistics teaches us that the standard deviation depends on the sample size, i.e. the number of measurements taken. As NAVGEN is based on the standard deviations of the Northings and Eastings, the error quantities (dRMS and CEP) depend on the number of measurements taken. In order to keep NAVGEN calculations compatible with each other, the author recommends to sample data with a rate of 1/s for at least 24 h (86,400 data sets). Fig. 4 below illustrates the decrease in RMS position error as a function of the number of samples or the measurement time. Due to the time-dependent random walk the term time should be more correct (see also Autocorrelation function). The effect of shorter measurement time than 24 hours is illustrated in Fig. 5. 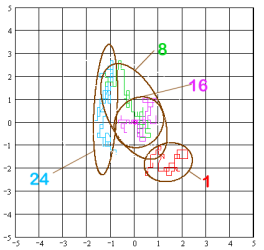 It shows a coordinate grid with the 24-h mean position in the centre (0/0). From the 24 h data set 4 one-hour subsets were processed starting at 0 hours, 8 hours, 16 hours, and 24 hours. 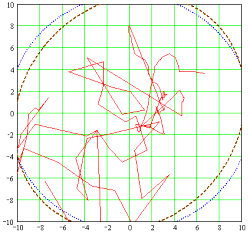 For each subset the position fixes' random walk and the 95% error ellipse are shown. The figure clearly demonstrates that sampling times, even in the order of one hour (3600 data sets), could yield a position offset of up to 2 m from to the 24-hour mean position. This offset does not only depend on the sample size, but is obviously also time-dependent. Fig. 5 also shows that short-time measurements (in the order of one hour) can deviate quite strongly from a circular distribution (in which cases the use of the Rayleigh distribution is not justified). The autocorrelation function shows the strength of correlation between the errors of successive position fixes. Such a correlation will result if successive fixes are not statistically independent from each other, but follow a certain pattern such as a random walk. The correlation factor drawn on the vertical axis of the diagram (Fig. 6) could vary between one and zero or even become negative. On the horizontal axis the data spacing is drawn. In this particular case the spacing is the time difference in seconds. 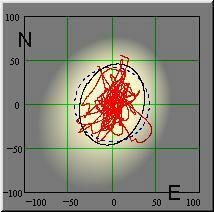 The graph below has been derived from the GPS data set recorded on 16 September 2006. It shows an exponential decay with a time constant τ of approx. 20 minutes. If we accept a residual correlation of ≤ 5 % (3τ) as sufficient statistical independence, then GPS data should be sampled not faster than once every hour. Of such data a sufficient number would be required to arrive at a statistically reasonable statement for the navigation error. Such a measurement would take several days. The NAVGEN algorithm follows another avenue and mathematically decorrelates the collected data, so that the measurement period can be shorter. The blunder error is a coarse error caused by the user, e.g. by permutation of decimals when writing down measurement values. This error is unpredictable and will not be considered any further here. When we are talking of measurement accuracy, then we usually mean the overall measurement error, i.e. the combination of the calibration error and the random error. In order to predict or determine the accuracy of a technical system, an error budget can created in which all known error contributions are listed with their magnitudes. The root mean square (RMS) value of all these is normally conceived as the measurement accuracy of the system. The calibration error is also called the 'Systematical Error' or 'Bias' and the random error the 'Precision' of the measurement. The following diagram (Fig. 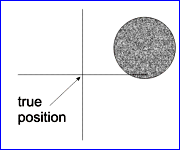 7) shows the relationship between accuracy and precision. One-dimensional errors that follow a Gaussian distribution are characterized by the 'Probable Error (PE)' in statistical terms also called the 'Median' having a confidence level of 50%. Half of the errors are larger, half of the errors are smaller than the probable error. Another error measure is the 'Standard Error' (SE) or 'Standard Deviation' (SD or σ ), having a confidence level of 68.3 %. Often the higer confidence multiples 2σ (95.5 %) or 3σ (99.7 %) are used. One-dimensional error statistics plays an important role in the determination of the position error, as it is applied to the measurement errors of the individual position coordinates. The standard deviations (SD) of these serve as the input to most further calculations. From the random errors of the Northings and Eastings the error ellipse can be calculated. For this purpose it is necessary to de-correlate the errors first. 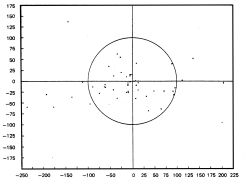 The de-correlation is achieved by 'turning' the data set by an angle that follows from the correlation factor. New standard deviations are calculated from the de-correlated data set. The basic error ellipse is described by the standard deviations of the de-correlated former Northings and Eastings and by the turning angle (Fig. 2 above). This ellipse has a confidence content of 39.3 %. If both standard deviations are multiplied by the factor of 1.177 (2.449), then the confidence content is 50% (95%). The confidence content can be calculated using the Mathcad Ellipse sheet (pdf / mcd). (i) For each measurement the error vector magnitude, i.e. 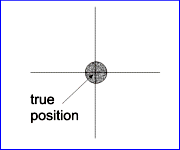 the distance from the measured position to the mean position, is determined. dRMS is then the standard deviation of these error values. (ii) For both, Northings and Eastings, the standard deviations (SDs) are determined. dRMS is then the root of the sum of the squared SDs. Unlike with the one-dimensional SD, dRMS error probability is not fixed, but varies between 63.2% and 68.3%, depending on the ratio between the SDs of the Northings and the Eastings (the larger to be used as the denominator), see Tab. 1 below. Besides dRMS the multiple 2DRMS is used, providing confidence levels that vary between 95.5 % and 98.2 %, see Tab. 1 below. 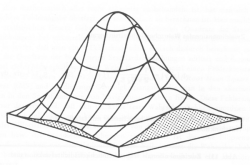 The genuine 2D error contour of positioning errors is an ellipse, as described in chapter 1.2.3 above. 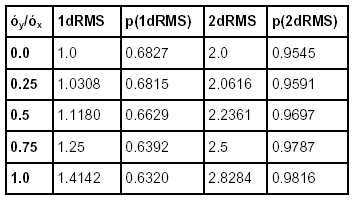 The dRMS values and their multiples generally do not provide a fixed confidence level. CEP is a conversion of the error ellipse to a circle of a per-determined and fixed probability content. CEP without an index or suffix is called the 'circular error probable'. The value provides the radius of a circle about the mean position with a confidence content of 50%. Other indices or suffixes provide a radii with the respective 'circular error probabilitiy', e.g. CEP95. The accurate calculation of CEP is quite intricate, as de-correlated standard deviations for the two coordinates are required and the two-dimensional probability integral (pdf / mcd) has to be solved (or tabulated values have to be used) to determine the CEP radius. There are also existing approximations for the CEP radii, which in the past were often used with the non-decorrelated standard deviations of the Northings and Eastings. Due to the processing power generally available today, these approximations shall not be discussed here. NavGen is providing the accurate solution, anyway. The measurement site should have as few obstacles as possible over the full horizon arc. Near-by reflecting objects could impair the data quality. Make sure that in your GPS set provides 'raw' measurement data and that filters, such as ‘Static Navigation’, 'Track Filter', or 'Dead reckoning' are not enabled. Static navigation is a filter used for car navigation. It freezes the measured position, if the GPS set does not move. 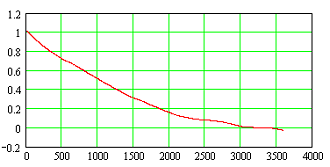 Track filters are preprocessing or averaging measurements. Dead Reckoning filters are estimating measurements during loss of satellite contact. Make sure that your set is sufficiently powered for the intended measurement time. The data collection should last at least for 24 hours, so that the GPS set has collected data during daylight and at night time, and has rotated fully under the entire satellite constellation. 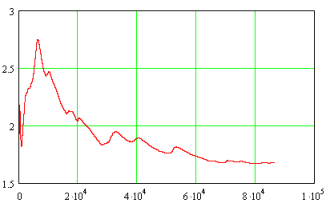 <Time in seconds><space><Latitude in degrees with decimals><space><Longitude in degrees with decimals>. The decimal separator must be a point and not a comma. For the conversion of the GPS NMEA log file to the required data table file, you can use the ‘GPS Data Parser’ software provided by the author. and the satellite navigation system TRANSIT. As numerous as the systems were the accuracy statements. For various statements such as 'repeatable accuracy' there was no generally accepted definition nor method of determination, nor probability level. In so far it was difficult, if not impossible, to compare accuracies of different systems. After some research, the author came to the conclusion that only one already existing term made sense to be used : the Circular Error Probability (CEP). Research Memorandum, Stanford Research Institute, November 1965. Bowditch: American Practical Navigator, Vol.1 1977. The theory contained in these reports, however, cannot be used directly - not least as certain data need to be looked up in diagrams. The NAVGEN algorithm overcomes these shortcomings by means of interpolation polynoms. NAVGEN provides a concise calculus for determining accuracy/precision of static navigation data using an input table of collected position fixes. International Hydrographic Review, Vol. 2, No. 1 (New Series), June 2001. POLARFIX as an Example; International Hydrographic Review, No. 1, 1990. Entwicklung eines Fehlerkreismodells; Ortung & Navigation, No. 3, 1987. The NAVGEN algorithm, as realised in MATHCAD® , can be downloaded and studied here in form of a PDF file and here as a MATHCAD file.